Badoo is a social network where you can meet new people. 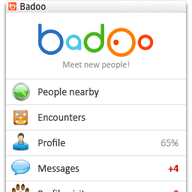 With over 150 million users, Badoo is great for chatting, making friends, sharing interests, and even dating! It's free and easy to use. Find new people near you now! Cant get on it from my phone why? Life is all about what u make out of it. kindly send to my phone. To this God be the Glory. I need this app is so good and easy to relate with. I lyk d chart,buh i tryd 2 download it i culd..So much heatreat.